The mosquitoes are dancing like mad at the moment, as are we it seems when fighting them off! But the grasses and taller plants in my garden are dancing too, as the warm and damp weather suits them just fine. My vase for Cathy’s meme (Rambling in the Garden) today is courtesy of my sister, who is staying with me for a holiday. She braved the biting insects (with the assistance of Autan insect repellent!) to pick some dancing flowers and arrange them on the patio. Once the photos were done we both came indoors and closed the doors again! Linaria purpurea, Foeniculum vulgare (Fennel), Centranthus ruber, Lysimachia, Erigeron (Fleabane), Heuchera, Crown Vetch, Calamagrostis varia, some sycamore foliage and a single pink Antirrhinum (Snapdragon). Hope you all have a happy and mosquito-free Monday! Lovely Cathy’s sister! You both have similar tastes I think. The only good thing about the dry spells we are having is less mosquitoes….your vase is spectacular and those colors are dancing and exploding like fireworks! Your sister seems to share your talent for arranging, Cathy! The sycamore foliage is a nice touch. And what a perfect name for this vase; the flowers must dance in even just the slightest bit of breeze! It doesn’t seem to be too bad a mosquito season here this year, thankfully! Perfect title for the bouquet! The insect repellant works most of the time, but the climate is very muggy so the garden is enjoyed from the sunny patio near the house at the moment! Does it get muggy every summer, Cathy? We do get very high humidity here, and being next to the woods doesn’t help, but we do have very dry summers too where we can get out in the hammocks down in the garden! I love the airy colourful vase your sister created, it reminds me of a meadow in full flower. We need more air-feeding birds and bats to eat up the mosquitoes I think. You are quite right. We were saying the same… we need some swarms of wasps and hornets and bats to eat them all up, and some newts and toads to eat the lavae everywhere! 😉 I haven’t seen many swallows and swifts this year either. Just lovely! Glad you’re having some nice sister time together. Sorry about the mosquitoes–they sure know how to ruin a party. Gosh, no mosquitos here! Can’t tell they are anywhere near by, as the photos are so bright and radiant! 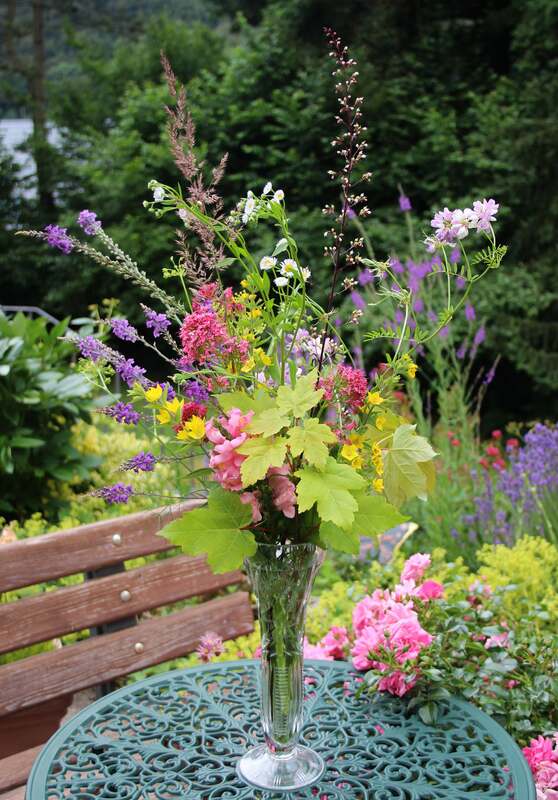 Another wonderful grouping of flowers Cathy! Thank you Deb. I am now thinking last year’s dry summer wasn’t so bad after all. At least there were fewer biting insects! Yikes! Your sister is kind to venture into the garden to collect a beautiful array of flowers for you. I wouldn’t have thought your area of the world would be as prone to the bane of mosquitoes. I hope the Zika virus isn’t a fear there as it is here. I clip on a wearable insecticide fan device on whenever I go out into the garden this time of year – but I had to be reminded to do this with a series of bites first. Your sister creates a lovely arrangement as you do. Must run in the family! Very elegant and brave heights reached with some of those flower spires. Sorry to hear about the mosquito problem though, that must be so frustrating. The mozzies are indeed a pain, but thank goodness the insect repellant does keep them at bay if I feel the need to go outdoors. Let’s hope this plague is over soon! Very summery bouquet, the addition of the Sycamore foliage was brilliant. I am betting my mosquitoes put yours to shame! I have recently planted Beautiberries for repelling mosquitoes, Calliocarpa. Hi Cathy! Beautiful vase and flowers! I like the addition of the leaves , makes it more interesting. I am so far Cathy, I hope you are too despite those pesky mosquitoes. I love the bouquet, Cathy, and in particular, the purple “spikes,” for lack of a better description! Here yo have the gorgeous, lush garden and mosquitos mar the pleasure. Every garden seems to have its enemies! I’m so glad you and your sister are both contributing to this fun meme and able to be together for a time. Very special! Hi Debra. The spikes are Linaria, which goes nicely with the lavender right now. We are hoping for some dry and windy weather to deter the biting insects, but sitting out near the house in the daytime is fine until around 5 pm! A very pretty vase of flowers and very brave of your sister to battle with the mosquitos! I love the delicate nature of this. Hope the insects move on soon so you can get outside to enjoy the garden. Wonderful vase! Tricolore comes into my mind with three main colours. I just reflect what country it could be. ..:) We have no mosquitoes. I wish you and your sister a wonderful time! I remember black clouds of mosquitoes after the Elbe-river-floot, 3 years ago. Kindergarden have been closed because of mosquitoes. Wet years are mosquito-years. My compliments to your sister. This is a lovely vase, perfectly in keeping with your Monday Meme. Sorry to hear that the mosquitoes are biting. They love fair skin, so I’m always part of the feast. I hope you’ve recovered. Thanks Alys! I am lucky this year as I haven’t reacted badly to any bites yet. I think the initial wave of mosquitoes has passed now and hopefully there wil be fewer over the summer. Cathy, that is good news. I get a few random bites here and there when I garden near dusk, but otherwise it hasn’t been too bad. We just don’t have the rain like you do to encourage them and now that the lawn is gone, they have even fewer opportunities to breed. It’s amazing what nasty little bugs can do to your system. My father had malaria in his youth when he lived for a time in India. I can’t even imagine. Here’s hoping we can all stay bite-free. That is a colourful bunch this week. I hate to think about mosquitoes, just the sound makes my heart sink. Smoke of citronella helps keep them at a little distance. Have the cream at the ready. The golden leaves really tie it all together and give it structure. Very nice! Thank you Ricki. I love those leaves too!